Porchetta (pronounced 'por-KET-ta') is an Italian culinary invention on par with crushed chili flakes, pizza, and gelato: indispensable, unequivocal, and, at its best, exquisite. Intrinsically and unarguably born and anchored in the country shaped like a boot, these, like many other foods, are as essential to Italian culture and history as the Colliseum, the David, and the meatball (which they do better than anyone). 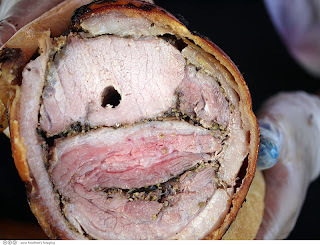 To make porchetta, for those of you unfamiliar with this most luscious and ingenious method of pork preparation, you traditionally begin with a whole pig, deboned, eviscerated, and cleaned. Next, you take the body, now completely removed of inedible parts, and roll it around a number of different layers, including but not limited to stuffing, meat, and fat. Along with the various layers of piggy perfection, porchetta typically includes a variety of mouth-watering seasonings and flavors, from citrus zest to fresh or dried herbs, sugar, plenty of salt, fennel, black pepper, chili flakes... whatever gets you going. The whole mess is then rolled, tied, and spit roasted over a wood fire for a nice, long time. The resulting masterpiece is what you see pictured above (courtesy of Roli Roti at the Ferry Building farmers' market): a thick, succulent layering of juicy pork meat, and tender deposits of fat, all surrounded by a skin so crispy you'd slap your pastor to get a taste. Bellissima! While the Roli Roti booth is a dependable place to get mind-blowing porchetta, the line tends to be equally as mind-blowing. I, myself, have waited forty-five minutes for a Roli Roti porchetta sandwich; and I would have waited longer. It's that good, especially on crusty Acme ciabatta with onion jam and bitter greens (usually arugala or some type of cress). As you near the front of the line, you stand directly in front of the spits, spinning mesmerizingly, dripping their golden juices over roasted potatoes that sit below. If you're really lucky, you may even get offered a sample of crispy skin from the shrapnel littered about the porchetta cutting board. People who are fortunate enough to enjoy this treat almost always end up embarrassed by the sounds they make as they bite into the heavenly morsel and its flavors melt into their taste buds. It gets a little sexual, I'm not gonna lie. Until recently, I was not aware of a porchetta in SF that even came close to the sandwiches at Roli Roti; and its limited availability (the booth only operates on Saturdays and the porchetta goes pretty fast, as you can imagine) only further elevates its status and appeal. But I ate at NOPA last week and made a thrilling discovery: on Tuesdays, the restaurant pulls its pork chop off the menu and replaces it with a completely house made porchetta. Mother. Of. God. It was all I could do to keep from getting emotional. How did I not already know about this? Had I really never been to NOPA on a Tuesday? Apparently I hadn't, because there was no way in hell such a beautiful and life-changing circumstance would have gone unnoticed by me. Porchetta is special, and you don't see it all that often, especially done really well (which is pretty much the only way they do things at NOPA). It goes entirely without saying that I ordered the porchetta and then proceeded to have a deep and complex relationship with it. Its layers were everything you'd want them to be: juicy, fatty, savory, tender, flavor-packed bites that presented a beautiful and fortunate dilemma: I was smiling so wide I had trouble chewing effectively. I saved some for Julia; after all, it was she who first introduced me to porchetta in Tuscany, where they treat its production like something between an art and a religion. In all honesty, I could have eaten two very generous portions by myself, but if I did that, I might as well have the pork surgically implanted into my aorta, and I'm just not ready for that kind of an operation. Besides, when I went to say goodbye to Laurence, the chef, my gushing praise of the porchetta took things even further: Laurence led me around the corner to where the most recently roasted rolls of porchetta were resting, tore off a crispy, fatty hunk from the best part of the loin, and handed it to me. It dripped bliss over my entire hand and exploded in my mouth into a million rainbows of flavor. Mouth full and stretched into a greasy grin, I thanked Laurence. He smiled, tore off another perfect hunk, and stuffed it into Julia's to-go box, feigning a fear of getting caught and glancing furtively around in mock stealth. Rest assured, his secret was safe with me.